Xiaomi has launched Redmi Note 5 and Redmi Note 5 Pro smartphone in India. Xiaomi Redmi Note 5 comes with 18:9 Display, 12MP Rear Camera. Honor 7X also comes with 18:9 Display. Check out price, Specs, Features comparison between Honor 7X and Xiaomi Redmi Note 5. Both Phones comes with Metal body, Fingerprint Scanner on The Rear. Honor 7X has a 5.93-inch (2160 × 1080 pixels) Full HD+ 18:9 display whereas Redmi Note 5 feature 5.99-inch (2160 × 1080 pixels) Full HD+ 18:9 display. Honor 7X is Powered by Octa-Core Kirin 659 processor with 4GB RAM and 32/64GB storage. Xiaomi Redmi Note 5 comes with 2.0 GHz Octa-Core Snapdragon 625 Processor. It has 3GB RAM with 32GB storage and 4GB RAM with 64GB. In terms of Camera Honor7X has 16MP+2MP Dual Rear camera whereas Redmi Note 5 has Single 12MP Rear Camera.Redmi Note 5 has Bigger battery compared to 3340mAh Battery on Honor 7X. 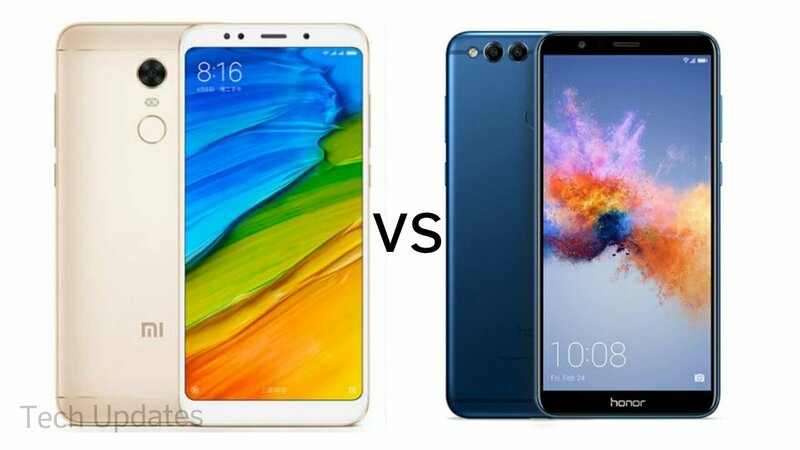 Honor 7X comes in Black, Blue and Gold colors price start at Rs 12,999 for 32GB and Rs 15999 for the 64GB model.Xiaomi Redmi Note 5 is priced at Rs 9999 for 3GB RAM and Rs 11999 for 4GB RAM Both Phones has 18:9 Display, 4GB RAM, No fast charging, No USB Type C. Honor 7X has Dual rear camera compared to Single on Redmi Note 5.